It's like they're aiming these at the manbaby side of the fandom who just want to pay again for what they had in the 80s. Because it's absolutely the exact same figure as the 80's version, articulation and all. You could have stopped with, "I don't like these particular figures." Not sure why the insult needed to be appended to the end. You've taken this differently to how I intended. As far as I'm concerned, both figures feel to lean too heavily into the 80s aesthetic in a way that almost makes them feel they weren't produced recently. I rather admire how Generations goes about updating and improving things so to get toys like this just feels like it's Hasbro aiming for a very specific, questionable niche. I mean they barely gave Soundwave a transformation but highlighted he can do the streetlight mode from the original cartoon. That's certainly a reasonable personal complaint. That being said, the goal of this line has been pretty clear from the start. This version of Soundwave is a pile of boxes, so that's what they've made - an articulated pile of boxes. There's nothing wrong with it not being your cup of tea; you've had truck Soundwaves, plane Soundwaves, car Soundwave, satellite Soundwave, and you'll have others. Pick one. My main issue was the unnecessarily mean-spirited name-calling. And, hello, 35th Anniversary logo! Edited by Sabrblade, 14 April 2019 - 09:43 AM. I think Brunt's secret UV Code should be PRTS4MR. Does the Prowl/Barricade/Bluestreak/Smokescreen mold use 5mm ports for the shoulder launchers, or something specialized? 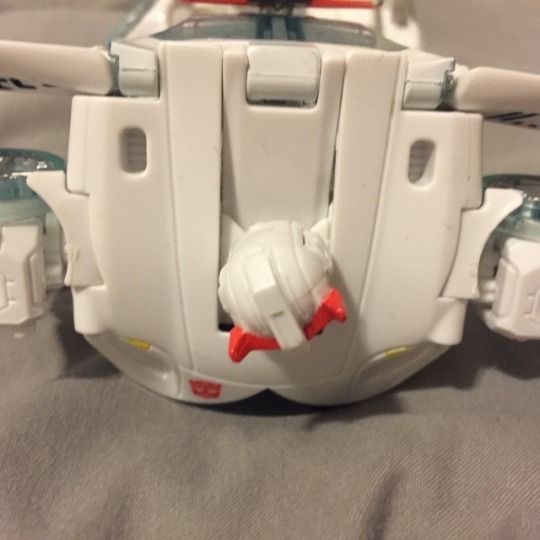 It looked like some sort of slot, which was why I wondered if I could get a Targetmaster on his roof, but it seems that the lightbar is a 5mm post hole. Weirdly, the two shoulder guns seem to combine INTO a gun that has a 5mm post. So can he wear all Arcee's stuff? As mentioned, something different on his shoulders. But the tops of his arms have 5mm holes. I checked, and no. They're not compatible. My Aileron custom sadly cannot use either version of Arcee's weapons, no. Aileron using Arcee's weapons would be nifty! Shame! Dang. I'll have to wait until I get one of them in hand, then (which might be a while since I'm skipping Prowl himself). Oh well. Why did Red Alert's lightbar end up so dark compared to the CG renders? I guess because of the smoked dark clear plastic used for the windshield. They couldn't make that become light clear red. Edited by Nevermore, 19 April 2019 - 06:17 AM. 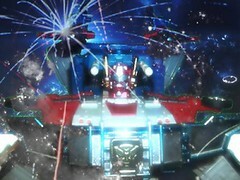 Those are Takara's stock photos, right? 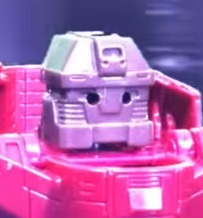 They might not actually be representative of the final toy, bc I remember at least their stock photos for Magnus still had his gun as being red instead of silver.